In molecular genetics, an open reading frame (ORF) is the part of a reading frame that contains no stop codons. The transcription termination pause site is located after the ORF, beyond the translation stop codon, because if transcription were to cease before the stop codon, an incomplete protein would be made during translation. Normally, inserts which interrupt the reading frame of a subsequent region after the start codon cause frameshift mutation of the sequence and dislocate the sequences for stop codons. Open reading frames are used as one piece of evidence to assist in gene prediction. Long ORFs are often used, along with other evidence, to initially identify candidate protein coding regions in a DNA sequence. The presence of an ORF does not necessarily mean that the region is ever translated. 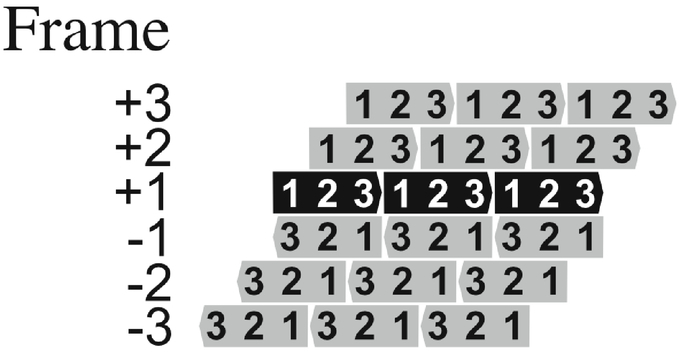 For example, in a randomly generated DNA sequence with an equal percentage of each nucleotide, a stop-codon would be expected once every 21 codons. A simple gene prediction algorithm for prokaryotes might look for a start codon followed by an open reading frame that is long enough to encode a typical protein, where the codon usage of that region matches the frequency characteristic for the given organism ‘s coding regions. Even a long open reading frame by itself is not conclusive evidence for the presence of a gene. Open Reading Frames: Frame +1 is the ORF predicted in the database to encode a protein. +2 and +3 are the other two potential ORFs in the same strand and -1, -2, and -3 are the three potential ORFs in the antisense strand. Possible stop codons in DNA are “TGA”, “TAA”, and “TAG”. Thus, the last reading frame in this example contains a stop codon (TAA), unlike the first two. Bacterial genomes display variation in size, even among strains of the same species. These microorganisms have very little noncoding or repetitive DNA, as the variation in their genome size usually reflects differences in gene repertoire. Some species, particularly bacterial parasites and symbionts, have undergone massive genome reduction and simply contain a subset of the genes present in their ancestors. However, in free-living bacteria, such gene loss cannot explain the observed disparities in genome size because ancestral genomes would have had to contain improbably large numbers of genes. Surprisingly, a substantial fraction of the difference in gene contents in free-living bacteria is due to the presence of ORFans, that is, open reading frames (ORFs) that have no known homologs and are consequently of no known function. The high numbers of ORFans in bacterial genomes indicate that, with the exception of those species with highly reduced genomes, much of the observed diversity in gene inventories does not result from either the loss of ancestral genes or the transfer from well-characterized organisms (processes that result in a patchy distribution of orthologs but not in unique genes) or from recent duplications (which would likely yield homologs within the same or closely related genome). Open reading frames are used as one piece of evidence to assist in gene prediction. If a portion of a genome has been sequenced, ORFs can be located by examining each of the three possible reading frames on each strand. Bacterial genomes display variation in size, even among strains of the same species. gene: A unit of heredity; a segment of DNA or RNA that is transmitted from one generation to the next. It carries genetic information such as the sequence of amino acids for a protein. codons: The genetic code is the set of rules by which information encoded within genetic material (DNA or mRNA sequences) is translated into proteins (amino acid sequences) by living cells. Biological decoding is accomplished by the ribosome, which links amino acids in an order specified by mRNA, using transfer RNA (tRNA) molecules to carry amino acids and to read the mRNA three nucleotides at a time. The genetic code is highly similar among all organisms, and can be expressed in a simple table with 64 entries. open reading frame: A sequence of DNA triplets, between the initiator and terminator codons, that can be transcribed into mRNA and later translated into protein.